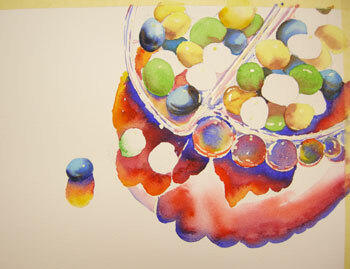 Here I have glazed the blue candies with a light, wet wash of French Ultramarine Blue to intensify the color! If you would like to paint along with this blog lesson, let me know. To receive an email with the pdf file of the photo reference and drawing for this painting, simply visit my etsy online shop and pay the $5.00 fee and I will send the references to you. Many people like to print off the daily lessons, then paint the project from those sheets. More to come soon on this lesson. Thanks so much for visiting. I love to hear your comments!